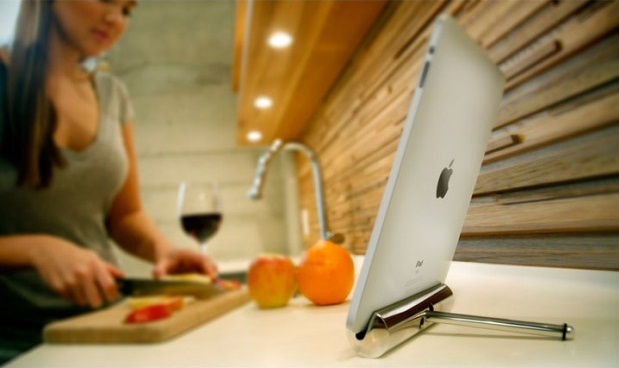 Need a fancy pants stand for your iPad? Have $129 to spend? Get yourself a crazy Joule stand. The Joule basically holds your iPod in a standing positon and its made from a few pieces of solid aluminum. It comes in polished or black anodized and you can request custom coatings or engravings. This thing is almost totally handmade in California by the same guys who made the amazing Element Case. Magnetically attached tilt foot at the rear allows for quick and easy view angle adjustments. Rubber pads at the bottom assure a firm grip on any surface. A velvet lined recess holds the iPad comfortably and securely.